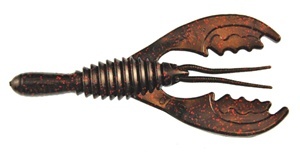 The Flappy Daddy is an extremely versatile Craw Worm that comes in three sizes 5", 4.25" and 3" for the Flappy Jr. The body is a solid body that holds a large hook for casting, flipping, or pitching. The front of the body is segmented and can be broken off for a more compact presentation or to be used as a jig chunk. Realistic craw arms have tremendous action and vibration on the fall or behind a jig. They are injected with Gambler BITE so fish hold on longer. Mega Daddy 5 Count and Flappy Daddy 8 count.